With ISTE behind us, it’s fun to reflect on the event that was. I think my ISTE style is unique; I don’t attend sessions. The older I get, the less I can sit still. For me, ISTE is about making new connections or building on relationships with people I learn with online throughout the year. My PD comes from the conversations I get to have with these edu-rockstars. And while I was able to meet some amazing people at ISTE and have a ton of awesome experiences, my Poster session with my former students will be something I’ll never forget. It was the highlight of my ISTE. Paisley and Alanis killed it. They never cease to amaze me. I’ve become, over time, a staunch advocate for giving up control of the classroom to students. It wasn’t easy at first, it scared me, but it was the best thing I’ve ever done as an educator and our poster session reaffirmed that yet again. Early last spring, Mr. Aviles had approached me about presenting at ISTE 2015 during the summer. Seeing that the only thing I had planned for the summer was sleeping until noon, I said “why not?”. I visited the official ISTE website and scanned Google for information about the convention, yet, I still did not know what to fully expect. Sure, I knew that it was a meeting ground for teachers to connect and share ideas, but I did not really understand what that meant. How big would it be? What would these teachers be asking me? Is anyone famous going? What am I even supposed to be doing? All these questions clouded my mind as our presentation day (June 30th) grew closer. 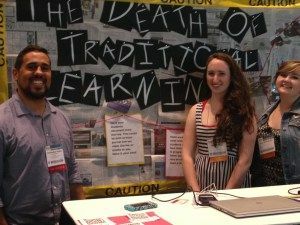 Our presentation was titled “The Death of Traditional Learning” and we set it up as if it were a crime scene. Our whole scheme was to show the death of traditional learning and the birth of Passion-Based Learning. We wanted to show teachers that students can do amazing things if they are allowed to apply what they love to their education. Passion-Based Learning is about giving students control of their education and letting them succeed in their own way. During the presentation, we talked about our technology-based English class as well as the Be About It Projects that we completed sophomore year and the crowd funding campaign experience we had as we tried to redesign our classroom. The best things about ISTE was definitely how interested other teachers were in what we were doing. While Mr. Aviles would tell us that people would Tweet him about all the cool things we did, it never really set in how progressive we really were. Seeing real life people who wanted to emulate what we created was beyond awesome. It proved that we were making a loud change in the education world. I was being asked how others can recreate our Be About It Projects and how they can become more of a 21st Century teacher. Though I don’t really know if teachers are going to take the advice we gave them, it’s satisfying to know that someone, somewhere, might get a better educational experience because of what we preached. I mean, I had a gentleman from China ask to record me speaking about Passion-Based Learning in the hopes of convincing his school board to consider changing their curriculum. Another teacher took my picture and wanted to use it to show his all boys school that girls can use technology just as fluently as boys. I had no idea what ISTE was going in, but coming out, I am so glad that I went. It was such a unique experience and I don’t think that I will ever do anything like it again. The teachers that I had the opportunity to speak with were so intriguing and it really gave me an insight on the educational status of the country. Some schools were struggling to afford textbooks while others had so much money they physically did not know what to do with it. It was a look at the world outside of New Jersey. If ISTE ever invited us back to speak again, I would do it in a heartbeat. GLHF and let your kids lead the way.